The current ruler is most like the one America overthrew in the Revolution. The current occupant of the White House has been compared to other figures from history from Joseph McCarthy with whom he shared the dubious legal counsel of Roy Cohn, a harrier Benito Mussolini, a character from a Sinclair Lewis novel, James Buchanan, a minor league Hitler, Andrew Johnson and, previously by this writer, Huey Long. George III was cited for “obstructing the Laws for Naturalization of Foreigners; refusing to pass others to encourage their migrations hither.“ The current occupant from the time of the announcement of his candidacy has defamed legal as well as legal migrants, ordered illegal bans, enacted a sadistic policy of separating children from their parents and concocted the empty promise to build a wall and make another nation pay for it. The king was called out because he “obstructed the Administration of Justice by refusing his Assent to Laws for establishing Judiciary Powers.” The president has repeatedly obstructed justice for daring to investigate his criminal activities including his blatant collusion with Russia in the 2016 election, and refusing to even recognize or in any way prevent Russian interference in the upcoming midterm election. .
George III “kept among us, in times of peace, Standing Armies.” The current president wanted to spend $92 million to parade on the streets of the capital to glorify himself in a manner befitting the Kims of North Korea and then blamed local officials when the parade was cancelled. The king was condemned for “cutting off our Trade with all parts of the world” and for ‘imposing Taxes on us without our Consent.’’ The president without justification of any kind has opened trade wars with our closest allies without consulting Congress. In doing so he has perhaps aided a few sectors of the economy but injuring a great deal more. And tariffs are just another kind of tax that the average person ultimately pays. The king was cited for “abolishing our most valuable Laws and altering fundamentally the Forms of our Governments.” The president has at every opportunity appointed corrupt and incompetent officials including family members, ended every environmental and consumer protection he can, deliberately destroyed the policies and regulations established by both Republican and Democratic administrations while spending more of a quarter of his time at his private resorts and golf courses, all at taxpayer expense. 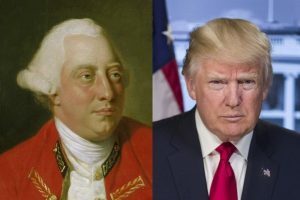 George III was charged that he “has excited domestic insurrections amongst us” The president by his tacit support for white nationalists and habitual attacks on African American citizens and others has brought the country to a level on conflict unseen for decades. Even the peaceful and heartfelt protests of a few NFL players was twisted into a wedge to further divide us. “A Prince,” the Founders wrote “whose character is thus marked by every act which may define a Tyrant, is unfit to be the ruler of a free people.” The current occupant has by thousands of large and small actions, never ending lies, and his contempt for the constitution demonstrated that same degree of unfitness to serve. The Founders had to wage eight years of bloody revolution against the king to secure their freedom. We need only impeach, remove or force the resignation of our would-be tyrant to secure ours and to restore dignity, competence and the rule of law to our government and our people.